List of Pre-Congress meetings below. The focus is on frailty, its opportunities and boundaries. We will discuss frailty from various perspectives, including risk factors, frailty in research, and how to handle frailty in clinical practice. Focusing on agentic capability or the personal capability to master gains and losses and at the same time experience wellbeing. Chair: Hanna Falk, AgeCap & University of Gothenburg. Here we focus on cultural representations of age and ageing, discrimination and ageism, digital inequalities, and medical humanities. 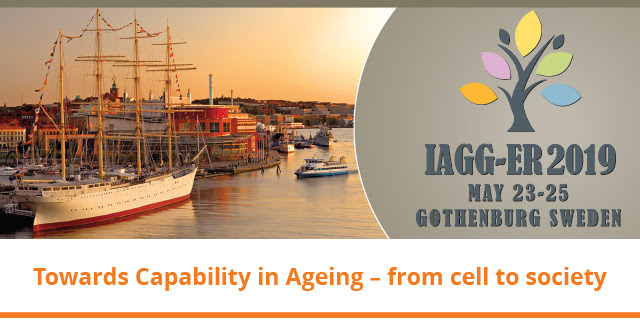 This is a collaborative meeting with the Aging Graz Research Group at C.IAS – Center for Inter-American Studies, University of Graz and AgeCap (Centre for Ageing and Health), University of Gothenburg. Chair: Maria Edström and Eva-Maria Svensson, AgeCap & University of Gothenburg. A long life is no longer the privilege of a selected few. Current demographics, however, requires a historical perspective in which we link the present and the past to achieve an understanding of future challenges. Extended working lives are proposed to secure the sustainability of pension systems in ageing societies. This interdisciplinary workshop will focus on the ageing work force, late working careers, and determinants of retirement transitions. Improved psychological expertise on older adults is needed and we will discuss these demands, educational activities, specialization in geropsychology and the need for adjustments of psychological interventions to these needs. Chair: Anne Ingeborg Berg, AgeCap & the Department of Psychology, University of Gothenburg; Birgitta Ingridsdotter The Swedish Association of Geropsychology (SGF); and Sara Hed AgeCap & the Psychiatric clinic for older adults, Sahlgrenska University Hospital, Gothenburg. Eldercare is in a transition with various models for receiving, providing and organizing homebased eldercare. We will especially focus on intercultural and cross-cultural variations of homebased eldercare. An extended working life and delayed retirement is proposed to ensure a sustainable pension system and better use of the human capital of older adults. The focus will be on how such change can be implemented within organizations.